Marc Morris ’19 became fascinated with archaeology while on a family vacation in southern Italy. Since coming to Dickinson as a community-college transfer student, he’s discovered that American archaeological digs are just as fascinating as those in the Mediterranean, and that an archaeologist can be an agent for change not only in the field but also in the wider world. Recently, he received word that he'd been awarded a Fulbright to pursue a master's in Mediterranean archaeology at Vrije Universiteit-Amersterdam. 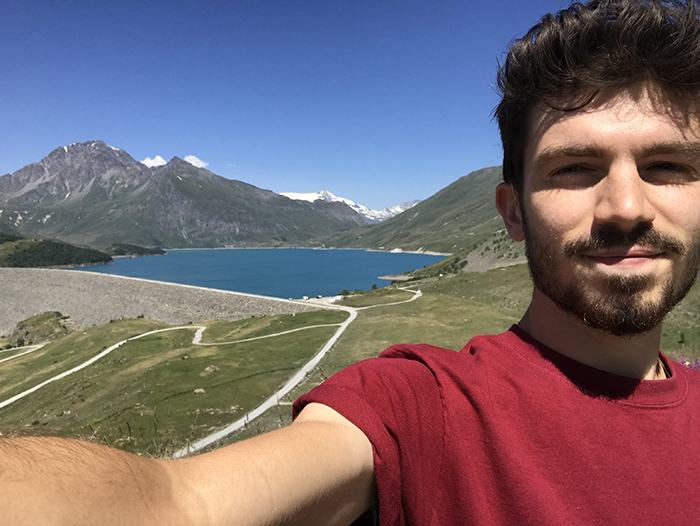 Below, he discusses his experiences working summers in Italy and sharpening his Italian through an Italian-literature class, his internship with the Lost Towns Project and more. Archaeology Club (president), Italian Club (treasurer), Fencing Club (vice president), Dickinson Campus Catholic Ministry, WDCV, Archaeology and Anthropology Majors/Minors Committee, The Hive, Eco-Reps and Italian-language peer tutor. Fulbright award, Eta Sigma Phi, Phi Theta Kappa Scholarship, the Dickinson Grant and the Hollister K. Petraeus '74 Scholarship. The Last Wish by Andrzej Sapkowski. Tous les Matins du Monde (All the Mornings in the World). I was always interested in the human past, but what really made me decide on archaeology specifically was attending a tour of an archaeological site in southern Italy, led by a Dutch team of archaeologists. The site happened to be just outside my mom's hometown of Mesagne, Italy, so I was amazed at what was underneath a place that had been a vacation spot for as long as I can remember. I hadn't imagined that I could actually take part in the discovery of my own past. I attended a transfer fair while I was at Howard Community College (HCC). There, I met Tara Fischer '02, and that put Dickinson on my radar. I did some more research, and, asking around, I heard very good things about Dickinson as an institution and about the archaeology program. Since I first began seriously considering college, I saw myself going to a small college much like Dickinson. But Dickinson's transfer partnership with HCC really sealed the deal in the end, and transferring went so smoothly. Tara and I even did the summer advising via video call while I was overseas. The Academic Quad on a nice day. Spicy corn & crab chowder (with an extra sprinkle of Old Bay). [Associate Professor of Anthropology and Archaeology] Maria Bruno. She is my advisor and my employer, but I have enjoyed and benefitted from her classes the most. She has truly been fundamental in shaping me as an archaeologist and a researcher. Even though I'm specializing in the ancient Mediterranean, I definitely feel influenced by the more anthropological and environmental approaches to which Professor Bruno has introduced me. I've learned that American archaeology is just as fascinating as that of the Mediterranean. She also reinforced in me the image of the archaeologist as an advocate for change both in the field and in society. Question everything, but choose your battles wisely. I've enjoyed all of my archaeology classes, especially the methods and theory classes, but my favorite goes to an Italian literature class, Discourse of Love, taught by James McMenamin, associate professor of Italian. It is the first formal education I ever received in Italian (I am a heritage speaker), and it has improved my writing, expanded my vocabulary and helped me appreciate my Italian half even more. I can now discuss the works of Dante, Petrarch and Boccaccio with all my Italian family and friends. I am a multi-instrumentalist and a polyglot, and I occasionally draw and paint. As a transfer student, I did not study abroad (as much as I would have liked to), but I did spend two summers working in Italy at the very same site with the very same Dutch program that pulled me into archaeology. … deceased family members whom I have not met or knew little of before they died. I am currently a Fulbright candidate to spend a year in the Netherlands at Vrije Universiteit (VU) Amsterdam to earn a master's degree in Mediterranean archaeology. Alternatively, I am looking at participating in the SITE or TAPIF programs in Italy and France respectively, before entering into a Ph.D. program. Having my Fulbright application sponsored by Dickinson. … I wouldn’t be hearing impaired. My parents. Had it not been for them exposing me to the past, I would not be an archaeologist. I interned at the Lost Towns Project, a contract archaeology nonprofit based in Edgewater, Maryland. At the time, I was looking to diversify my experience and keep myself occupied during the winter 2017-18 intercession, and it was local. While unfavorable winter weather affected how much I could work, I learned a lot about contract archaeology, or cultural resource management (CRM). There was always something to do. If there were no projects out in the field, then there were plenty of artifacts that needed cleaning and cataloging. I also got to excavate in a couple of people's backyards as well as in the basement of a historic house in downtown Annapolis. These were all very different settings from dusty, sunny southern Italy, and they brought with them their own ways of doing archaeology. I have a case of imposter syndrome, but my time at Dickinson has taught me that I really do work hard for and deserve the good things that come to me.